Today's victim went for the same message as previously featured British model Danielle Lloyd. Her back is supposed to read "Only God is my Judge". By some miracle, she got the sentence structure right. No such luck with the spelling, though. There are four words in this girl's tattoo, three of them are misspelled. Who's up for a game of "find the difference"? 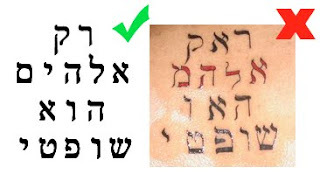 Seriously now, if Hebrew is not your native tongue and you're set on designing your own Hebrew tattoo, at least verify its correctness. Upload your design to Flickr or ask at Yahoo! Answers. This kind of disaster doesn't have to happen! Needless to say, regardless of correctness of spelling - this sentence sounds ridiculous to any Hebrew speaker. I don't know, maybe it sounds just a bit awkward but it's not that bad. Yes, it very nicely says: Kar me'hallah, ve aah, yi'ta'pesh. ("Colder than challah bread, and ahh.. it get's stupider") To remind herself not to put the bread in the freezer. Takes too long to defrost in the middle of the night. I haven't found yahoo-answers much of an 'ohr le'reg'lei' (lamp unto my feet) but maybe... Shavua tov. Yonatan - except, of course, that the English word "hallah" is a bad transliteration of the Hebrew word חלה, which is not what she has tattooed into her back. And Shai, you're totally right. Colloquial Hebrew would be רק אלוהים שופט אותי or something like that. The possessive form (שופטי for השופט שלי or שופט אותי) has allmost disappeared in modern usage. 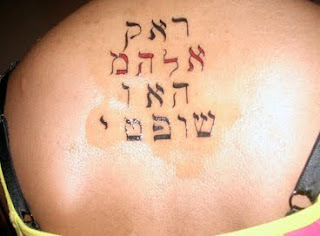 Of course, it is not clear that she'd want colloquial Hebrew usage for her tat. I mean, is she making a statement to god? Or to some Israeli dude who is looking down the back of her shirt? Or to alternative judgers?